Comments: Reddish Egrets are typically found along the coast. Although usually reddish, there is also a white color morph. Both morphs have blue legs and a pink-based black-tipped bill. Feathers on the head give breeding adults a shaggy appearance. Unlike the stealthy techniques used by other egrets and herons, Reddish Egrets hold out their wings and run and lurch in an erratic fashion while chasing fish and other prey in shallow water. 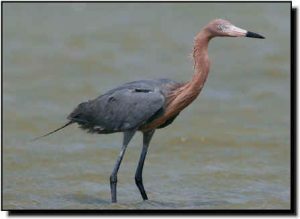 Reddish Egrets occur in small numbers or are found only in localized sites within the Great Plains.